My inspiration for C&H blog posts knows no bounds–magazines, newspapers, HGTV, friends and family–and now, television commercials. 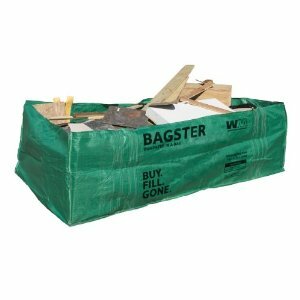 Last night, I found myself intrigued by an ad for The Bagster, a dumpster in a bag that can be purchased at local home improvement stores and, post-project, hauled away by scheduling a pick-up. Once The Bagster is full, place a call to Waste Management to schedule a pick-up. Service is available in most large metropolitan areas, and the company says additional locations are being added regularly. The approximate cost to haul away one mixed-waste load is $109, and $89 for each additional bag. Waste Management says The Bagster is cheaper than renting a traditional Dumpster. If you try it out, let us know your thoughts!